With a breathtaking view of the endless blue sea, Als Marmarei was built to reflect the aesthetic principles of Feng Shui philosophy in the natural stone colors. It also adopted the plain and elegant forms of Cycladic architecture in order to match the environment and to embrace the visitor, revealing the energy of the place as a point of direct contact with him. 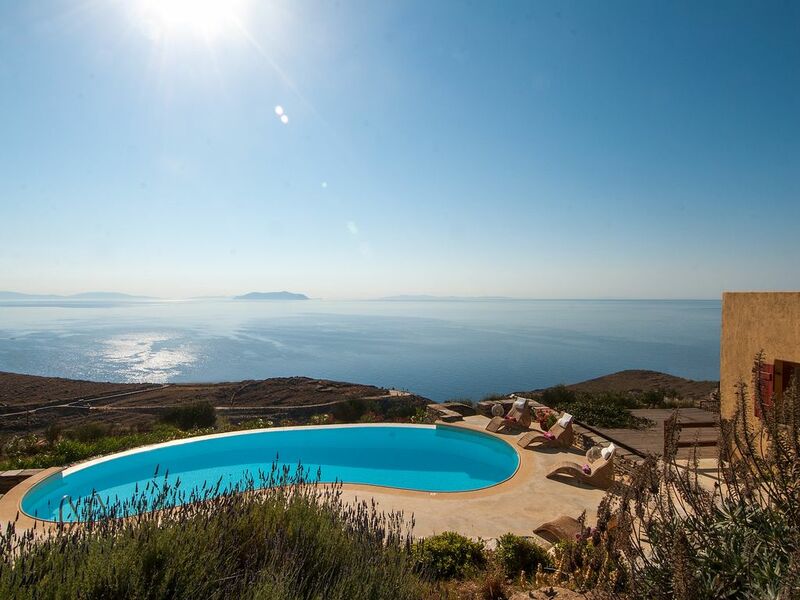 The cluster of cottages is situated on the east coast of the island, nestled on the top of a hill next to a wild canyon, overlooking the blue sea and eleven other islands: Andros, Tinos, Giaros, Siros, Mykonos, Serifos, Siphnos, Kithnos, even Paros and Naxos and Evia in the far left. Kea’s best beaches, Sykamia and Kalidonihi, with their crystalline waters and Cycladic stone lapped by the sea, are very easily accessible. Kea, also known by the name Tzia, is a different and slightly mysterious island. It is cosmopolitan, serene and peaceful at the same time, as well as rich in attractions, thanks to its long history at the cross-roads of Mediterranean life and its well-preserved archaeological sites. Kea is also blessed with an uncommon natural beauty and fabulous beaches, not to mention its famous walking paths. The more one gets to know Kea, the more one falls in love with it. The island’s inland and seaside beauty gradually engulf the senses and one becomes bewitched by its charm. Perhaps its best feature is that it lies only one hour by ferry away from the port of Lavrion, just a short drive south of Athens’ Eleftherios Venizelos International Airport. Using ALS MARMAREI as a base, guests can explore the wild beauty of the island as well as visit the main town, Ioulida, that is very special, and admire the grain mills and the ancient stone lion that, according to myth, chased the nymphs from the island. Visitors can also stroll on the famous ancient paved paths, visit the temples of Apollo and Athena in ancient Karthea, swim in virgin, blue waters facing the nearby island of Kythnos, enjoy the sun and sea on the island’s other wonderful beaches and, at night, dine and dance the night away in the cosmopolitan marina in Vourkari or the beach bars in Koundouros. 1 full bathroom. 5 shower bathrooms. Notes on accommodation: A caretaker lives on the premises and can provide immediate assistance at any time. Cleaning and linen changing services occur twice weekly. For those wishing to order prepared meals, a menu will be provided but this will involve extra charges. Outside: On the verandas, there are bamboo sofas, tables with fitted chairs, a built barbecue, a big hand-made table which can host about 16 guests. Other amenities include a spacious parking area, an outside shower, deck chairs and umbrellas complimenting the pool area. 50m2 swimming pool. Cleaning / Towels / Linen / Maid service: Towels and linen are included. Cleaning and linen changing services occur twice weekly. Sykamia beach 3 min drive. Kalidinichi beach 5 min drive. Athens airport to Lavrion 25km. Lavrion to Kea port 1 hour by ferry. Kea port to property 15km. At ALS MARMAREI, the visitor will discover solitude and be at one with nature. Beautiful beaches, hiking trails, unique archeological sites, attractive restaurants in the capital Ioulida (15 minute drive), water sports in Koundouros (30 minute drive), as well as more restaurants and nightlife at the Port and Vourkari. Booking Notes: Please enquire. Changeover Day: Please enquire. Notes on prices: Prices are in case of over 17 people when the place is rented exclusively. Less than 17 people please contact us.